The Assessment Office coordinates the scheduling and administration of university required assessments and surveys, and then distributes those results to federal, state and local decision makers. 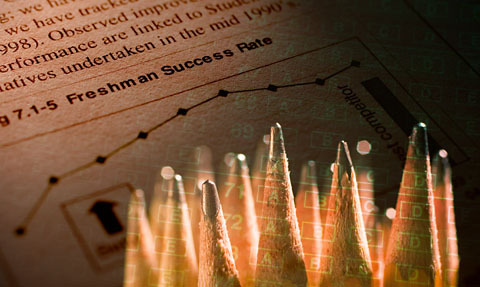 College students across the nation take proficiency assessments, major field exams and satisfaction/engagement surveys so that institutions of higher education can demonstrate program effectiveness, identify areas for curriculum improvement, and build programming that engages students in the greater world community as well as their chosen academic discipline. Northwest reports the results of these assessments and surveys to the Missouri Coordinating Board of Higher Education, the Departments of Secondary and Elementary Education, and to accrediting agencies including the Higher Learning Commission and the National Council for Accreditation of Teacher Education (NCATE). Northwest faculty and staff use results to evaluate and improve the quality of core proficiencies, major field, and co-curricular programs. What you should do - Yes, we're talking to you! As an undergraduate student, you are required to participate in several assessments and surveys. You may refer to the assessment policy in the undergraduate catalog (catalog). You should also check with your advisor to see if your major has a specific assessment requirement. Check this Timeline that outlines the approximate points in your academic experience when you should expect to participate in an assessment or survey. If you receive an email from the Assessment Office telling you to register for the Assessment of Core Proficiencies, click this. Need to register for a MoGEA, Missouri Content Assessment (MoCA), Praxis, ACT, SAT or other exam? Click here.